Junot Diaz on Heartbreak, Love and his Latest Book, "This is How You Lose Her"
Junot Diaz, now on a 30-city book tour, said he was looking forward to barnstorming America. 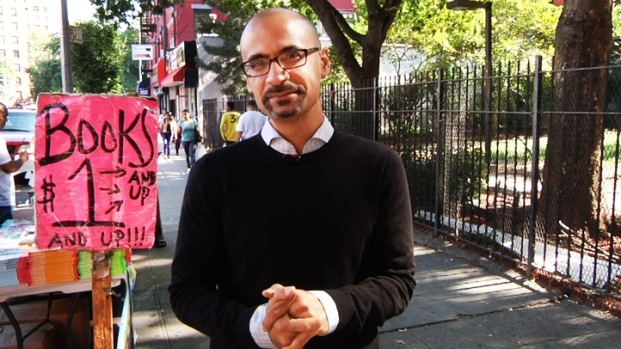 Junot Diaz, at the age of 27, became a literary sensation with the publication of his first book, "Drown" (1996), a collection of short stories. His readers had to wait more than a decade for his second book, "The Brief Wondrous Life of Oscar Wao," a novel that won him the 2008 Pulitzer Prize. His third book, "This is How You Lose Her," a collection of short stories about love, fidelity and heartbreak came out on Sept. 11. He spoke to NBC New York about his life and his new book on the eve of its debut. Last time we met was in 2008 in your East Harlem apartment, where you were living with your fiancé. (That relationship has since ended and Diaz now lives in West Harlem.) Since then, how do you think you’ve changed most significantly? I’m gloomier. My friends don’t know this. I get ribbed by my friends for being the most optimistic one. Yeah, I’m sharp-minded and critical, but I’m the one who absolutely refuses to lose his faith in human beings. What have you learned about women and relationships that you wish you had known then? What would you tell yourself? Where does a MacArthur “Genius” go for books, pizza and the perfect view? Author Junot Díaz shows us his favorite stops in East Harlem and Washington Heights -- home to one of the largest Dominican communities outside the D.R. For more discoveries off the island check out his latest book, "This Is How You Lose Her." I would say, “Get the f**k into therapy. You need therapy three times a week and all your friends need therapy.” The other thing I’ve discovered: It takes a lot more heart to be a good partner than to be anything else. And I didn’t know that. I thought writing a good book was the hardest thing in the world. My whole life I had this derangement. I am now aware of the enormous courage that is required to be in a relationship, to be a good partner, to be honest. Because your short stories are semi-autobiographical, have you ever been concerned about revealing too much about your personal life? I know that the work transforms utterly any attempt I make at subtle autobiography. By the time the work gets done with it, it’s unrecognizable. In fact, the book that is completely fiction, "Oscar Wao," I would argue is more autobiographical for reasons I will not go into here ... If a rumor is going to give my work more verisimilitude, I won’t discourage it. Sometimes you get a lot simply by giving your protagonist your same nickname. In a good short story we are reminded in indelible ways of how final certain decisions are, how irretrievable certain chapters in our lives are, the many ways we lose people and moments and parts of ourselves. The novel is an interesting contrast. You read a novel and you know that you will not be ejected from this world to the last page. But that’s not the way life works. So you see life not as a novel but as a series of short stories? "This Is How You Lose Her" has many stories that feature a male protagonist who is a compulsive cheater. Can you talk about how you’ve managed to do these two things: (1) make the female character fully human and three-dimensional yet (2) make the man somehow sympathetic. How did you achieve that balance? I imaged these things as simultaneous. I could simultaneously have full human female characters—even if the narrator doesn’t see them fully, the reader will. It was an endless struggle. The amount of versions of the stories that I went through, it was like coming up with your own chili. At every stage I would taste it and say, “Ehh.” I had to spend six or seven years on a story till I got it right. Is six or seven years usually how long you take to complete a short story? I can think of a couple stories that took longer. “The Cheater’s Guide to Love” took twelve years. Some friends of mine crack up, because they remember reading these stories when I was still in Brooklyn. As incredible as "Drown" is, I think "This Is How You Lose Her" is even better, more mature. How do you think you’ve evolved as a writer? Now I like my work to feel more human, to feel less like it’s been blowtorched in the rewriting process till it gleams. Now I tolerate more looseness. Yunior [Diaz’s real-life nickname and a name he often uses for his protagonist] dispensed wit in one sentence. Yunior was like some strange, efficient metabolism. He wouldn’t reflect too much on a thing. But now I allow Yunior to just sit on something for a little bit. Now I don’t mind if Yunior doesn’t say the right thing at the right time. But what I’ve learned more than anything is that sometimes the best version of the story is not something an MFA professor would admire the most. I used to have this very demanding idea of what would make a good story, and I’m not sure that I was listening to the story itself. These days I have learned to listen to my material more. Now the stories feel like they have much more blood in them. Your stories manage to combine the language and ideas of two seemingly disparate worlds—academia and the urban street. How has that evolved? I realized that part of the function of my writing was to create a home for myself. A lot of my faculty friends [Diaz teaches writing at MIT one semester a year] don’t speak Spanish, they don’t know what it’s like to be in an immigrant community. And there are plenty of my Dominican friends, who I see every damn day, who have no interest in my esoteric, nerdy pursuits. Eventually I realized that the only place these two worlds come together for me is when I write. I certainly wasn’t aware of that in "Drown." And I became more aware of it when I was writing "Oscar Wao." You’re often asked about your favorite fiction authors, but very rarely about poetry, which is strange, because so many writers—like Raymond Carver, Denis Johnson, Pablo Neruda—are in both worlds. So what poets do you read? And what do you take away from them that you bring to your short-story writing? I love poetry to death. Recently I read a book of poetry by Kyoko Uchida, a Japanese American. I love Angela Shaw. Wow! Eduardo Corral. Dynamite! Aracelis Girmay got this book called "Kingdom Animalia." F***ing incredible, dude! Poets, in one page or two, bring down as much lightning as a novelist does in a whole novel. It’s no accident that people are haunted by poems. With so few words, poets create a universe. And they trap you in it for the rest of your life. I can't. Not even once. What are the top-five biggest mistakes fiction writers make? 1) Not reading enough. 2) Being far more obsessed with approval than with what the work is demanding. 3) Way too much awareness of this as a profession rather than as an artistic calling. My students already know about agents. That’s kind of insane! 4) This is self-serving, but I certainly don’t think that most people who write and publish are taking long enough. 5) Not writing as a reader. Most of the young writers I know seem to be writing for other writers. You’re promoting a new book. I’m not asking you to burn any bridges, but are there questions that you’re just sick of answering? Yeah, questions like: How has immigration, being a person of color, and not being white affected your writing? How the f**k can a person answer that? I never hear white writers being asked, How has your whiteness affected your writing? In 2010 you were elected to the board that awards the Pulitzer Prize. How is that going? We had a heartbreak last year with fiction [no fiction prize was awarded]. A book needs a majority to win, and I only have one vote out of 17. It’s been an interesting journey, though. It feels nice to be in the world of Santa Claus. Really what I do is help grant these wonderful gifts. Is your next book going to be a work of science fiction? It’s supposed to be. I don’t know if I’ll finish it. It’s kind of like a virus-monster-invasion story, set in the Dominican Republic and Haiti. It’s called "Monstro." On Thursday, Sept. 13, you are taking off on your 30-city book tour. What are you looking forward to? What are you dreading? I love this kind of barnstorming, because you get the strangest rapid appraisal of the country that you’ve ever received. It’s really interesting, especially before an election. I totally love to talk to strangers. I may be painfully shy in formal situations, but when it comes to anonymous conversations, I will talk to anybody. My curiosity, my love of civic engagement, and my love of books all come together.